The Kids License Monitor looks at two metrics: appeal and hype status. Appeal is all about overall popularity of a license. Hype status is about how much kids actually like toys based on a license. So, let’s take a look at overall popularity. And to make things short: Star Wars does not register at all among the top 10 most popular licenses among kids in the UK, France and Germany. Even without any new movie the Minions are still the most popular license across the three countries. Other popular licenses are Playmobil and, this will make Disney happy, Mickey Mouse. As you can see Star Wars does not register among the top 3 licenses for girls at all. Only boys aged 10-12 like Star Wars. But when we compare the IV/2018 report with the previous report for III/2018 we see that Star Wars actually makes the top 3 of popular licenses among boys for the first time in 2018. Looking at past data from the last two years Star Wars only makes the top 3 popular licenses among boys in Germany once. Last quarter. This should be cause for concern for Disney and Lucasfilm. Because a movie such as Batman v Superman made the top three most popular licenses among boys twice. Star Wars in general seems to lack a certain appeal for kids. And Star Wars does fare better here. It is in 10th place in Germany and even in 2nd place in France. But what may be disturbing for our friends from the UK, Star Wars is not among the top 10 licenses at all in this category. 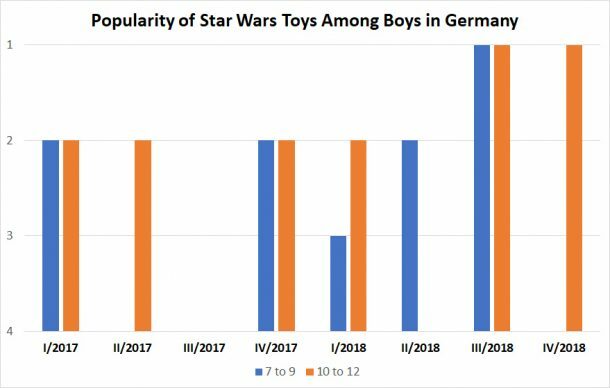 The good news is that older boys in Germany still like Star Wars toys the most. But among younger kids it’s not among the top three licenses. However, looking at past data this age group is quite fickle when it comes to their preferences. And girls have vastly different interests, they love Frozen and licenses more geared towards girls in general. 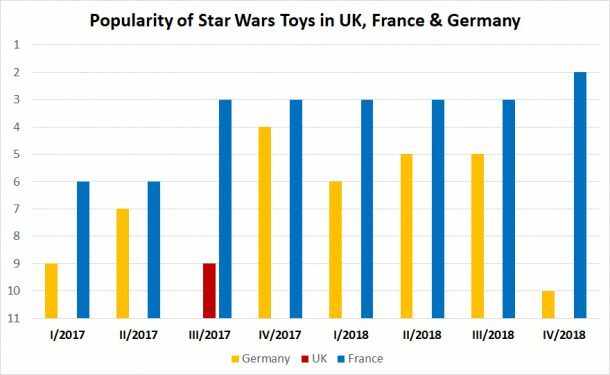 As you can see, for some reason kids in the UK don’t really like Star Wars toys as much as kids in Germany and France. Instead the UK has Harry Potter among the top 10 popular licensed toys. Star Wars only made the top 10 of most popular toys in the UK in III/2017. French kids love Star Wars toys the most, it’s been among the top 3 most popular licensed toys for over a year now, even increasing in popularity in the last quarter without any movie release. That may bode well for Galaxy’s Edge in Eurodisney Paris. German kids are much more fickle when it comes to Star Wars. Unfortunately without more data we can only guess what the reasons for the vast differences between the three countries are. It may very well be that cultural differences play an important role here: Harry Potter, while a universally beloved franchise, is still a very British thing and therefore maybe more popular in the UK than elsewhere. But this is just a guess. The age group 4-6 doesn’t list Star Wars toys among their top 3 licenses even once, but once boys reach 7 Star Wars appears on their radar. And both age groups 7-9 and 10-12 more or less equally like Star Wars with some fluctuations here and there. The 7-9 age group appears to be more fickle and Star Wars can be the most popular toy license in one quarter and no longer make the top 3 licensed toys in the next quarter. Without more data it’s difficult to say what the reasons are. It may be tied to the release of movies or the lack of releases. So to sum it all up… there are huge differences between the UK, France and Germany when it comes to the popularity of Star Wars toys among kids. And when we look at gender, girls in Germany are into very other things and Star Wars only makes the top 3 licensed toys among boys and only when they are older than six. But when we talk about overall popularity then Star Wars doesn’t make the top 10 in neither of the countries studied, other – more kid friendly – licenses are the winners here. It seems that Star Wars as a whole struggles to connect, which may be explained by a lacking appeal to girls, other franchises might have a more universal appeal. Star Wars is only really popular with boys, apparently, at least in Germany. And even here popularity can vary greatly from quarter to quarter. Which means Disney and Lucasfilm must find means to engage children more often. They should also think about adapting certain formats for foreign markets since kids in France and Germany probably will not watch English language YouTube videos. And whether or not getting girls into liking and buying Star Wars toys is a lost cause may also be up for debate. Maybe Disney should focus on what they have and not on what they don’t have. Previous attempts at getting young girls into Star Wars were not met with much success. Maybe Disney would be best served if they focus more on boys and their preferences again since despite all the female main characters in Star Wars, girls – at least in Germany – simply enjoy other things much more, more traditional “girly” stuff, so to speak. Even if they have more action oriented female Star Wars characters to identify with than before. 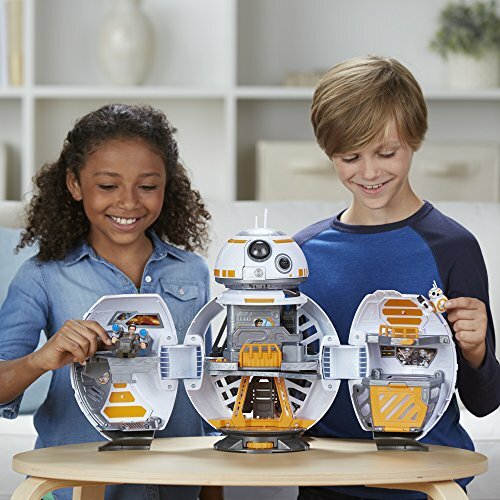 It seems there is still a gender divide between girls and boys when we talk about Star Wars toys despite various attempts to change that. Unfortunately no similar data seems to exist or is freely available for the USA. And things may be different there. So all we have is data from the three most important European toy and Star Wars markets. With the very limited data freely available we can say that once boys reach school age they apparently get to know Star Wars and learn to like the toys. But even so, Star Wars as a whole fails to make the top 10 popular licenses and in Germany it made the top 3 popular licenses among boys only once in the past two years. Disney has some work cut out for them if they want to engage more children with Star Wars. And what do you think? How are things where you live? Give us anecdotal observations, if you like. Are things much different in the USA or elsewhere?